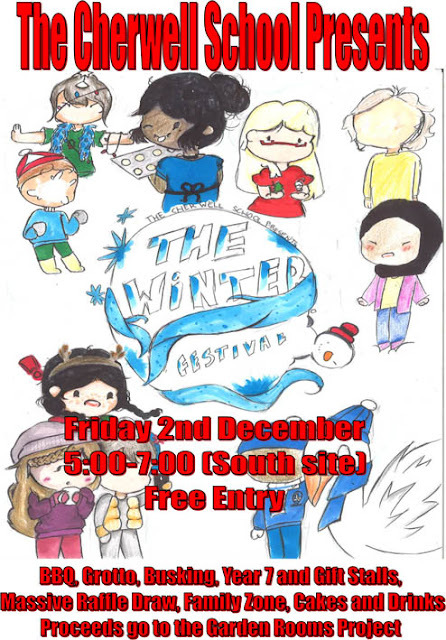 We are pleased to present the winning entry for the Cherwell School Winter Festival 2016 poster by Dora Thompson. This was voted for by Year 7s who are busy preparing their stalls ready for the big day. As the festival is a Whole School Event, a wide array of clubs and year groups are also getting stalls ready, while the Base is providing hot chocolate - more details soon. We also look forward to meeting Year 6s and their families - come and see what a great place Cherwell School is (and try out the chocolate tombola and family zone). cakes and refreshments (alcoholic and non-alcoholic).